Paco de Lucía, Master of Masters. His music will always be alive and will continue being the reference for this genre. He left us a heritage, as usual among the best, with humility and mastery. The creation of the genius from Algeciras, collected in his extensive discography, is more than a proof to categorically claim that he was one of the most important personalities in the world of music in the 20th and 21st centuries. Within the official collection of Paco de Lucía, and as per the request of his scholars, we have decided to make two volumes of great hits. 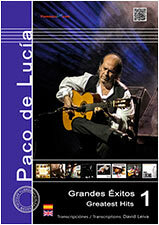 This is the first volume, and includes 8 pieces of great importance in the career of Paco de Lucía. Although all his discography is a great hit, we have selected those we consider the most extraordinary, such as “Entre dos aguas”, “Almoraima”, “Solo quiero caminar” and “Antonia”, pieces that revolutionize the flamenco guitar. The transcriptions are made for one and two guitars depending on the theme. The pieces are shown in note and tablature with fingerings of both hands and dynamics. Paco de Lucía´s interpretation is as important as its composition.